Go ahead, FPGA – make my day! Field-Programmable Gate Arrays (FPGAs) are off-the-shelf silicon chips whose function can be determined (programmed into them) by design engineers. This means that one chip can be programmed to perform many different functions. There are a tremendous variety of FPGAs from different vendors, each with different capabilities, advantages, and limitations. Low-power FPGAs are appearing in a wide range of handheld electronic devices, while high-end FPGAs are being used for applications that would previously have required the use of a custom integrated circuit. All of this means that companies who may have not have used FPGAs in the past are now starting to consider FPGA implementations for their next-generation designs. 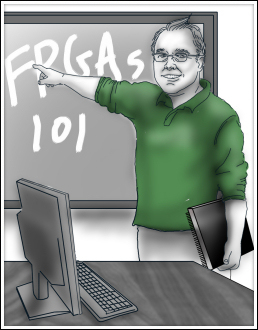 Therefore, I have designed an FPGA 101 seminar to help you and your employees understand the various FPGA options and how they can be used in your future products. This informative seminar, which can be customized to address your unique needs, is based on my book The Design Warrior´s Guide to FPGAs – Devices, Tools, and Flows. Contact me today to talk about your FPGA seminar needs!